The propolis broad spectrum of therapeutic properties is documented by the literature1. Development of propolis based products requires a comprehensive evaluation of both efficacy and safety2. This research was aimed to evaluate the in vitro potential toxicity of North-West Romanian propolis ethanolic extracts previously studied for antimicrobial properties3. The cytotoxic potential was investigated considering propolis biocompatibility on human fibroblasts cell culture (cell line HFL-1) using the 3-(4,5-dimethylthiazol-2-yl)-2,5-diphenyltetrazolium bromide (MTT) assay and evaluating the cell morphology and attachment level. The MTT results expressed as optic density were further used to calculate the viability percentages by dividing the absorbance reading of cells under different propolis concentrations by the absorbance reading of cells under normal growth. The differences between values were analyzed using ANOVA post hoc, followed by Dunnett test (against the control) or by Bonferroni test (against different dilutions). Propolis samples were also characterized using spectrophotometric assays for the quantitative determination of flavonoids (flavones/flavonols, flavanones/dihydroflavonols) and total phenolics (Folin Ciocalteu method).While the spectrophotometric methods indicated the typical poplar composition profile with flavonoids and phenolic acids as main biological active compounds (total phenolics of 38.02% ±2.34%, high amounts of total flavonoids 9±0.3%, with 1.74-9.22% flavones/flavonols and 1.96-4.01% flavanones/dihydroflavonols), MTT test data suggested concentration dependence of propolis-induced effect. The highest dilutions stimulated cell viability (125-131.58%) and did not significantly impact the cell morphology and attachment levels, while the highest tested concentrations had moderate expressed cytotoxicity. Further in vitro and in vivo studies are intended to complete the cytotoxicity profile of the tested propolis samples. 1. Dantas Silva RP, Machado BA, Barreto GA, Costa SS, Andrade LN, Amaral RG, Carvalho AA, Padilha FF, Barbosa JD, Umsza-Guez MA (2017) Antioxidant, antimicrobial, antiparasitic, and cytotoxic properties of various Brazilian propolis extracts. PLoS One 12(3): e0172585. 2. Campos JF, dos Santos UP, Macorini LF, de Melo AM, Balestieri JB, Paredes-Gamero EJ, Cardoso CA, de Picoli Souza K, dos Santos EL (2014) Antimicrobial, antioxidant and cytotoxic activities of propolis from Melipona orbignyi (Hymenoptera, Apidae).Food Chem Toxicol.65: 374-80. 3.Niculae M, Stan L, Pall E, Paștiu AI, Balaci IM, Muste S, Spînu M (2015) In vitro synergistic antimicrobial activity of Romanian propolis and antibiotics against Escherichia coli isolated from bovine mastitis. Notulae Botanicae, Horti Agrobotanici. 43(2): 327-334. ISNAD MATES, Constantin I. , PALL, Emoke , SPINU, Marina , STAN, Laura , NICULAE, Mihaela . "Preliminary Evaluation of the Cytotoxic Potential of North-West Romanian Propolis". 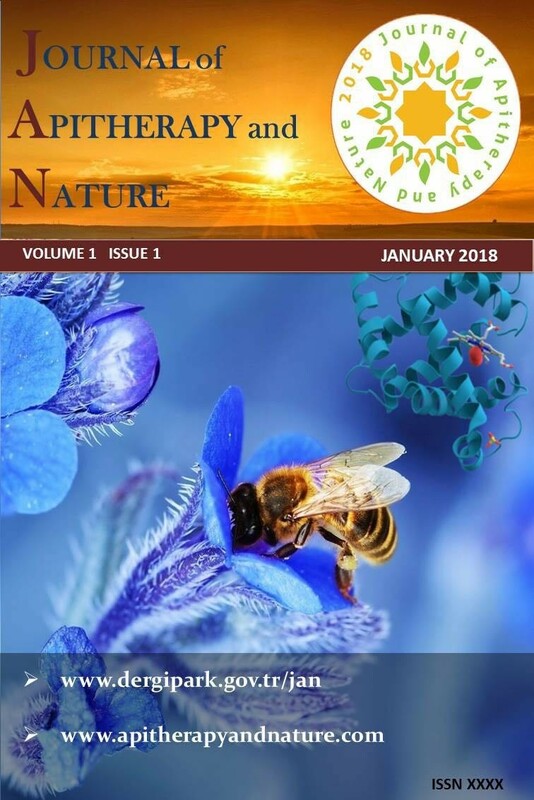 Journal of Apitherapy and Nature 1 / 3 (December 2018): 52-52.